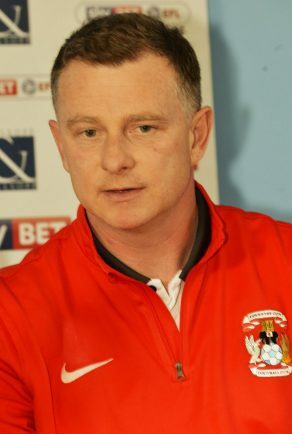 COVENTRY City manager Mark Robins has said 13 or 14 players have been missing from training this week, ahead of tomorrow’s League One game against Charlton at the Ricoh Arena. The news comes amid a busy schedule for the Sky Blues, which sees them play five games in just 22 days – including two games over the bank holiday weekend. Robins said: “We’ve had 13 or 14 players missing this week. We need to make sure the 11 on the field can do the job. Despite concern, Robins has said is pleased with the reaction from his Coventry City squad since taking charge, though admits his young side still has room for improvement. Following four wins in their last five competitive games, Robins’ side enter tomorrow’s game on a positive run of form. He said: “Tomorrow is a tough game. Charlton are a good side and they’ll want three points for obvious reasons. “We want the three points as well to keep in with a chance of staying up. The former Manchester United forward spoke highly of his side’s attitude since taking charge at today’s pre-match press conference. Robins underlined the improved confidence in the dressing room and said most players now ‘expect to win’. He added: “We’ve made significant progress, winning games being part of that. “We had won five all season before I came in. To win four out of five shows there’s potential. “They’ve knuckled down and put in good performances, I think a lot of that is to do with confidence and winning games. “Port Vale was a good win, we took confidence from that game to beat Bristol, then Wembley, even at Sheffield good performances came within the game. A loss tomorrow will confirm Sky Blues’ drop to League Two for next season, while a win could keep hopes of staying up alive depending on the outcome of other games. “I don’t think relegation will come as a shock to anyone,” said Robins. “I think everyone has hoped for the best and feared the worst. There’s 12 points to play for and we’re 11 from safety.